Coachella is only two weeks away followed quickly by BBC Music’s The Biggest Weekend, Isle of Wight Festival and before you know it V Fest will be on the horizon. 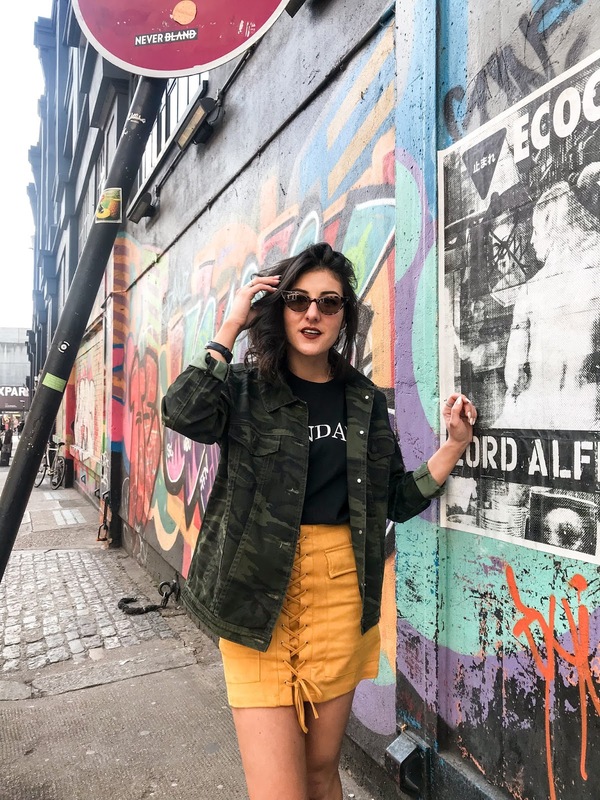 I’m getting ready for festival season early this year thanks to Pretty Little Thing – super early as my festival of choice is Leeds Festival at the end of August – and I’m challenging myself to ditch my trusty denim shorts and think outside the box for my festival fashion. 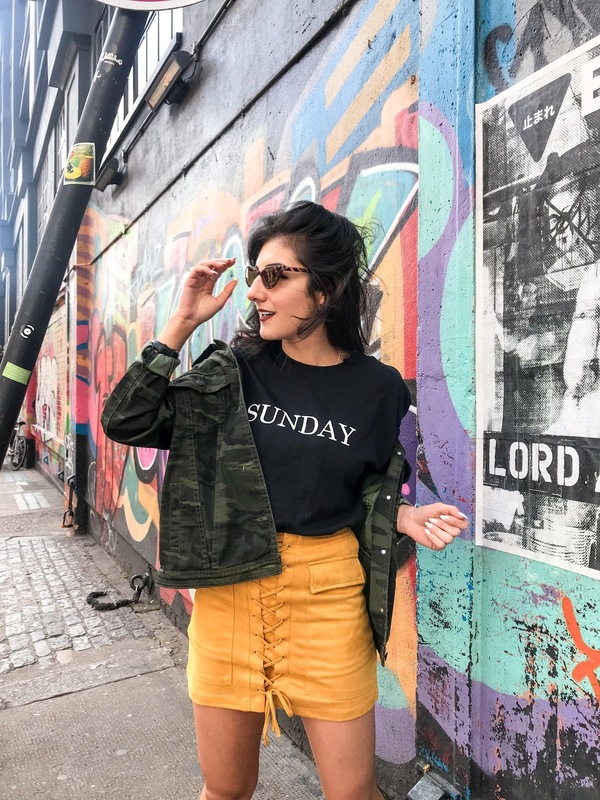 When the weather gets warms enough, vintage Levi denim shorts replace my black jeans as my everyday outfit staple. I love them and wear them to death, but so far 2018 has been a year where I’m pushing my style a bit further, I’m trying to be bolder, more confident and resting on old safety nets just aren’t a part of that. I want to enjoy fashion without feeling self-conscious. I don’t want to worry if something is too revealing for my age or size, whether the colours are too bold or whether its ‘appropriate’. Life is too short and bygum it’s festival season. I say, anything goes, and a festival is the perfect opportunity for you to release your alter ego, and channel that inner diva for a seriously fierce look. right? WRONG! FORGET THE DENIM SHORTS! This ‘Sunday’ Oversized Tee is lush ; it can be tucked into something else or worn loose with jeans or cycle shorts. If you don’t like it in black, or Sunday isn’t your favourite day of the week, there are 6 other colours and 6 other days to choose from. 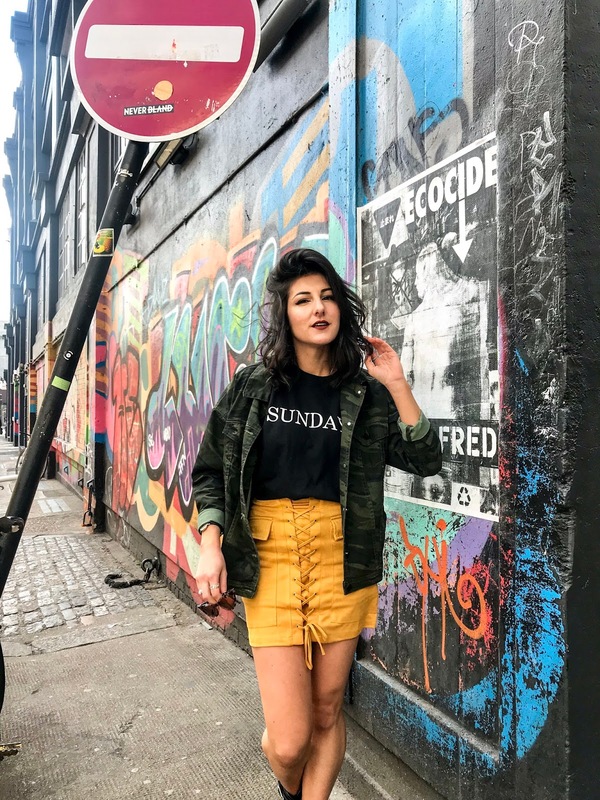 I went with a skirt as a denim shorts alternative for outfit 1 – let’s face it I’m not the type for sitting on a strangers shoulders to Blink 182 these days – and as soon as I saw this Mustard Faux Suede Lace Up Mini Skirt I was in love. I’ve never worn anything like it, I don’t own anything that colour, fit or length ; it ticked all new Tabby’s boxes. Again available in different colours, I was so surprised at how comfortable and flattering this was. 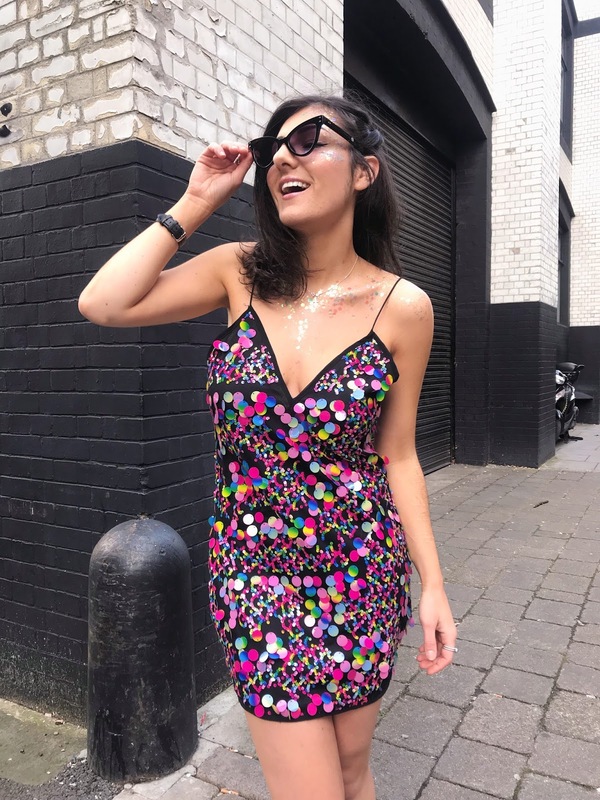 I couldn’t collaborate with Pretty Little Thing and talk festivals without choosing the Rosana Multi-Disco Sequin Shift Dress. It is everything I wanted to break me out of my comfort zone and throw caution to the wind. 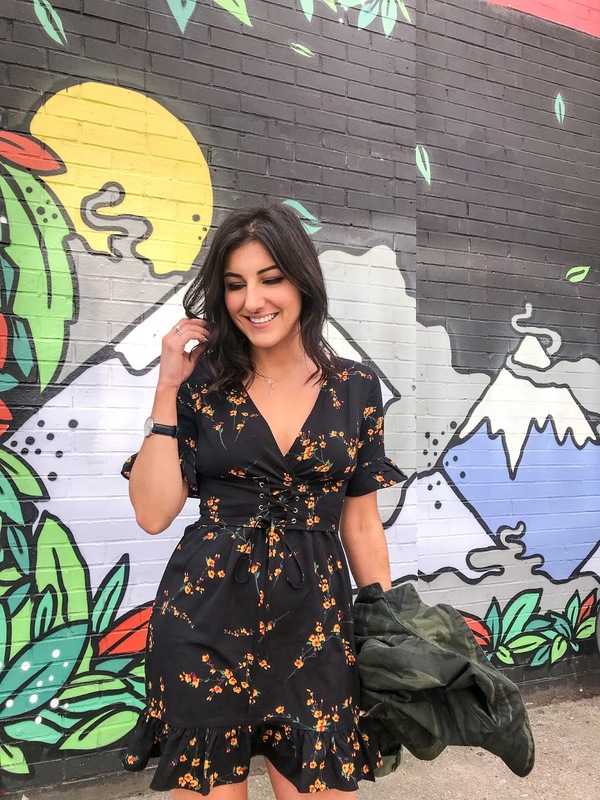 Now I can hear your protestations from here as to why you can’t this wear dress because I had all the same ones ; ladies with an ample bosom worried about how low cut it is? I hear ya ; I wore a black plunge, strapless bra and although you could it slightly on my back it worked a treat. It’s a shift dress ; not bodycon, not skintight, it has room to move, dance and be comfortable after your 3rd portion of cheesy chips. You think its too dressy? Too glam? 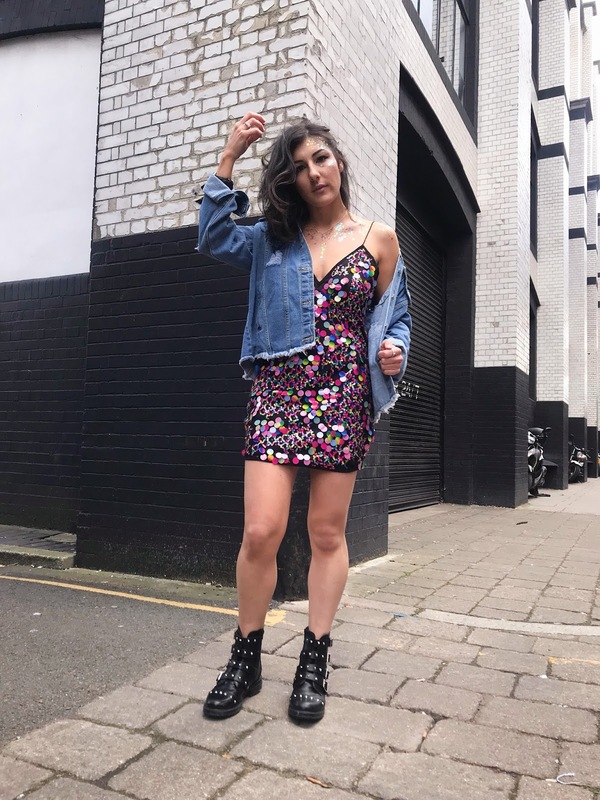 I dressed this sequin dress down by wearing a pair of chunky Black Studded Buckle Biker Boots and the Abegaila Mid Wash Distress Oversized Denim Jacket. I mean come on, I look like I walked right off the main stage at Glastonbury. It’s PERFECT. 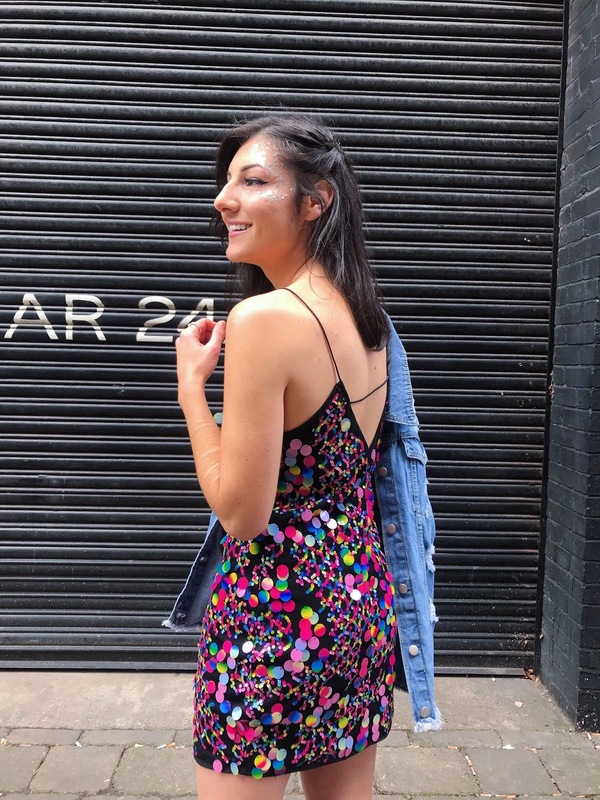 If you’re on the other side of the fence where this sequin dress isn’t enough – join my glitter party! I used Gypsy Shrine Chunky Unicorn Glitter Pot all over my décolleté and face with some Vaseline, sprayed over it with hairspray, and it stayed all day. My third outfit definitely feels like a day festival or concert that you can wear a hundred times over throughout the summer. 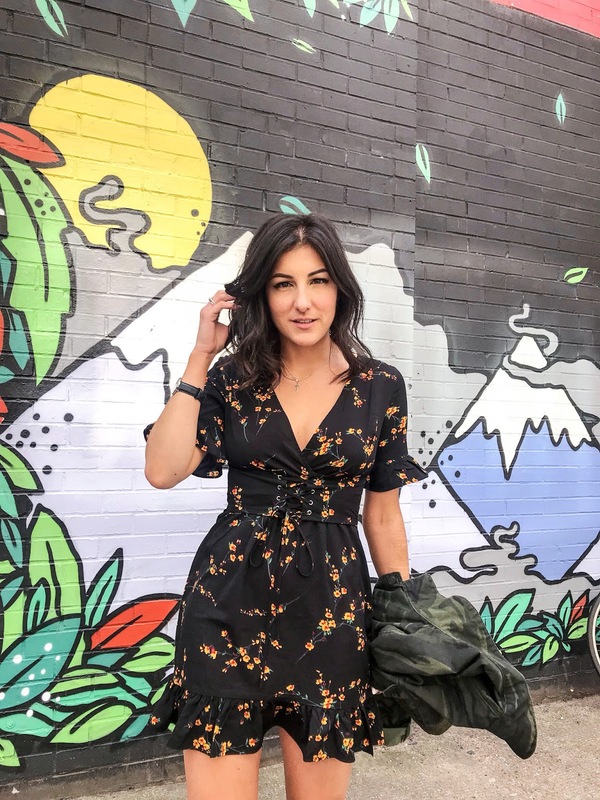 I love ditsy floral prints because they hide all manner of sins and the cinched waist on this dress will create shape, even if you don’t have the most defined waist. Get out your tiny violins for a second ; my body shape is very much hourglass but I’ve never felt comfortable with my figure so I would always try to hide it. Sob sob, poor me. No lie, when I ordered the Black Floral Corset Swing Dress it scared the bajeebas out of me. V neck?! A bodice?! But ohhh wow do I feel incredible wearing this dress. 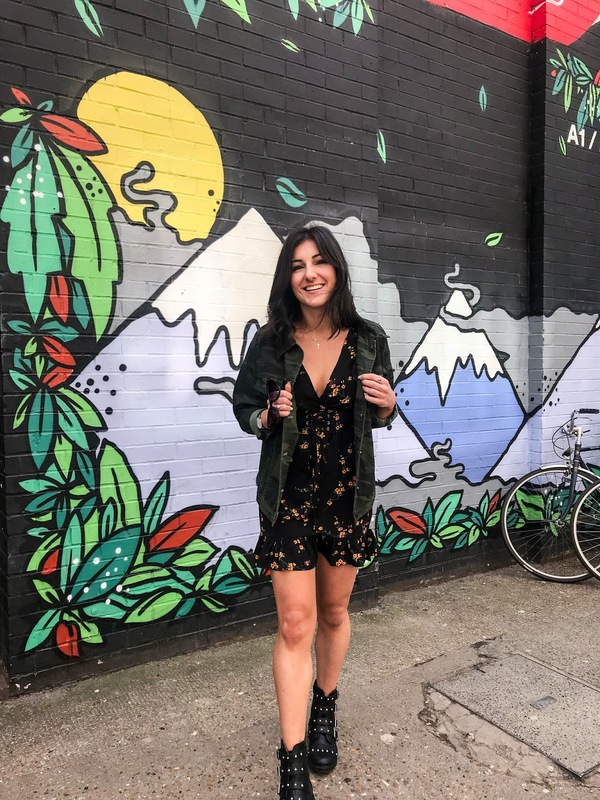 I teamed this dress with my Black Studded Buckle Biker Boots again and got bold clashing my prints with the Khaki Oversized Camouflage Denim Jacket. Couple of tips I picked up recently ; clash your prints, it’s cool these days. Dainty and feminine with masculine shapes or colours works a treat. Also, if you’re going tight and short on your body, throwing on an oversized jacket mellows the whole look. It goes from slutty to cool real quick. What do you think? 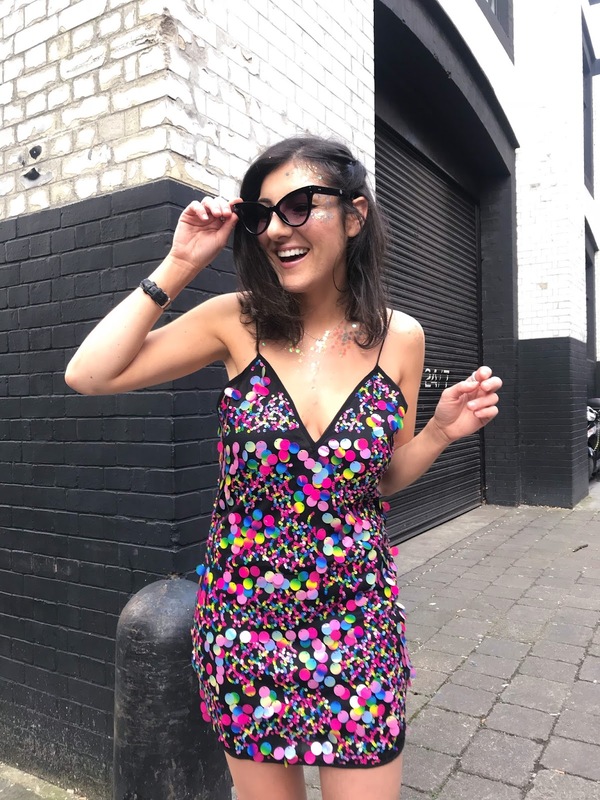 Did you like my Pretty Little Thing picks and will you be ditching your denim shorts and challenging yourself to think outside the box this festival season? Tabby this post is incredible!! I’m in love with how you’ve styled every single one of these outfits, you look so gorgeous in that floral dress! You’re so right, festival style can be anything you want it to be. Dressed up, dressed down, you make the rules! Thank you so much for taking the time to read the post Pip! You're such a babe ALL THE TIME! !